For this creek daylighting project in a new city park, we were asked by the engineer to think about the character of this region and develop an ecologically based placemaking approach to guide the form that the new creek will take. This park is located at the Fall Line, the location where two different regions- the Piedmont and the Coastal Plains- come together. The Fall Line is marked by waterfalls and shoals where the differing elevations meet. The Fall Line was a significant landmark to early American settlers, who developed cities in these locations, where the falls blocked ships from traveling further upstream. 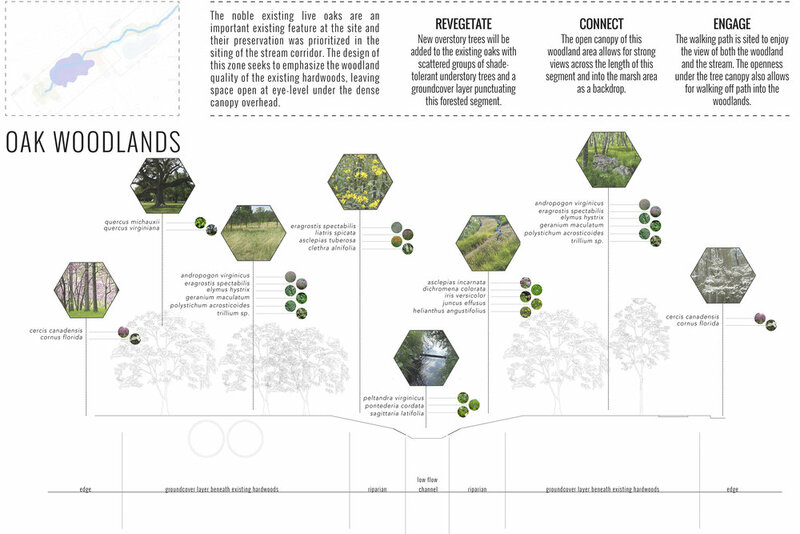 Our proposal, Daylighting the Fall Line, identified plant communities, geological features, and the overall form of the creek to respond to the unique ecological conditions of this particular locale.